Pump, tyre levers and patches or spare tube. There will always be someone to help you with punctures or other mechanicals, but always best to be self-sufficient just in case you're at the back. A small multi-tool is handy as well. Waterproof jacket if it looks like rain. A warm one if it looks cold. If coming by public transport see our bicycles on public transport article for info about any restrictions for taking your bike on tube and train. If cycling there or coming by car, see the postcode and map link provided with the details of the hash location on our main page. 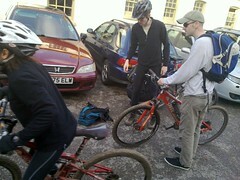 When you get to the bash site, you should see plenty of bashers faffing getting their bikes ready for the ride. Ask any one of them for the Hare, the Grand Spoke or the Hash Cash, who will register you as a virgin basher, and ensure you are looked after. The hare will give a ride briefing before the ride. This will inform you of any special aspects of the ride that day. Ask any questions you have at this point. The hare sets the trail in flour. So you should follow the blobs of flour. 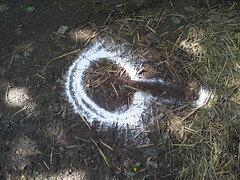 When the flour trail stops and you find a circle drawn with flour, then you have found a Check. You should shout "On Check!". The idea of the Check is to slow down the FRB's (Front Riding B*st*rds), allowing slow riders to catch up. From the Check you will need to check in any direction to try and find the trail. The trail should resume within about 500m of the Check. Whilst checking, respond to any "Are You?" shouts with "Checking!". If you arrive at a Check and think people are already Checking, shout "Are You?". Any responses of "Checking!" will let you know which directions are already being investigated, allowing you to go checking in another direction and avoid duplicating their efforts. When you have found the trail you must ensure you break the Check. Using your foot break the Check circle in the direction of the found trail. 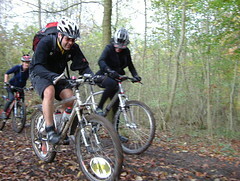 This allows those behind you to catch up as they wont have to search for the trail. The only exception to this is if you know that there are people at the Check waiting for you to find the trail. Then you can shout "On On! "and those at the Check will be responsible for breaking the check. If you are waiting at the Check or out checking and hear "On On!" called, then shout "On Called!". This lets others still arriving at the check, and those who are out checking other directions to know that the trail as been found. And it also indicates that trail has been found, but that the person shouting "On Called" is not necessarily on the trail yet. 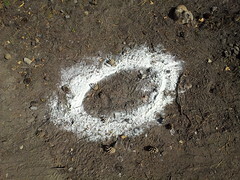 When the flour trail stops and you find a bar drawn across the trail in flour, it means you have been on a false trail. You will need to go back and start checking where the real trail goes. The above may sound complicated, but in reality it is pretty simple, and as a virgin bike hasher you should just come along and give it a try!